See scan - perfect condition. 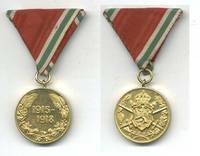 This medal was awarded to participants in the First World War. Made out of silver gilt. Nice and rare Bulgarian Royal item.